It’s what happened five years ago, one year ago, and yesterday. And while companies need to remember lessons learned, they also must react to historic events taking place in today’s rapidly changing landscape. What we’re trying to do at Design Glut is capture the cultural zeitgeist and create objects that everyone can relate to. In this cultural moment, everyone is feeling the recession. It’s ubiquitous. Suddenly it’s OK to talk about losing money and being frugal, rather than previous eras in which everyone was trying to show off their extravagance. 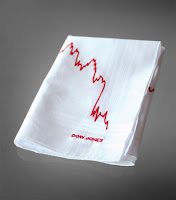 The Dow Jones Hanky is a clever acknowledgement of today’s history, and sends a comforting message—“It’s OK to cry.” Other Design Glut products include a line of jewelry referencing the rising price of oil and its impact on American culture. What inspires them? Kinnmark generously shared with us some of Design Glut’s favorite pieces.